Well, given the weather forecast yesterday we decided to pull the remaining veggies from the winter garden. And, looking out the window right now, that was a good call! We pulled a bunch of turnips and carrots, and clipped some greens for a last salad or two. We did try another small experiment; Suzie and I left a short row of carrots in their raised bed and covered them with mulch hay bales. We put whole bales around the bed and then filled in with loose hay, and covered the whole thing with some surplus storm windows so we could get at the carrots later. We'll check every week or so to see how they are doing. Hopefully we will get at least to Christmas with our carrots. By the way, the carrots we pulled were unbelievably sweet; I've read that this happens, but had never gone this late in the year before to try it myself. 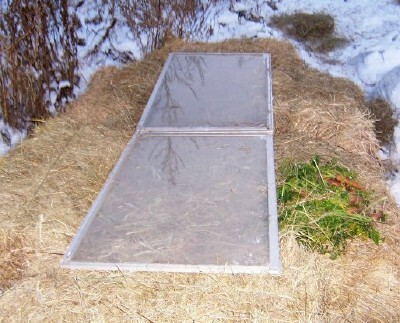 FYI, this whole experiment is part of our plan to evaluate providing a 'winter share' to our CSA customers next year. I figure between picking the right the cold-hardy crops to grow, our small unheated greenhouse, and storage crops, we can provide perhaps a dozen different veggies until about mid-December. If successful, this would extend our CSA delivery season by about 2 months, and show that even in the Great White North we can grow a lot more of our own food than we currently do. And, in a side note to David Suzuki, how about coming over to help shovel my driveway, the 'global warming' around here is piling up in drifts. Just kidding, Big D.